If you're the kind of person who enjoys lifestyle game such as The Sims, then Redshirt might just be for you. It's not going to appeal to everyone, thanks to its less than traditional gameplay, but if you fancy something a little different which has a good sense of humor, this could be for you. 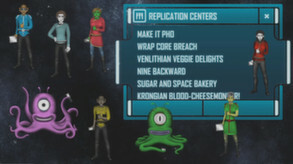 The game is a sort of spoof of Star Trek-style science fiction shows and is basically a social networking sim of life on board a galaxy exploring ship. You'll have to navigate all the complexities of social niceties that come with a working spaceship, dealing with all the various personalities onboard in order to raise your social standing, all while a galactic crisis develops in the background. The game makes fun of current social networking fads, and offers players the choice to advance themselves in a variety of ways. You can choose to be a hardworking schmuck or try and schmooze your way to the top by getting those all important likes, while there's also a wide range of skills and abilities with which you can customize your character. Redshirt is an intriguing game and if you're prepared to give it a whirl and aren't expecting action and adventure, then you might find yourself having a good time. There's a good sense of humor on offer here and spotting all the references to Star Trek and other shows adds to the appeal. The gameplay can be a bit confusing to start with, with a lack of clear goals and a slightly wonky interface which takes some figuring out, while the humor starts to grate after a while. Overall though, it's still an enjoyable experience.